This is how to drain your old coolant, flush the system out completely and then replace the coolant. This DIY was written using a 91 Nissan Silvia, but should be similar to most cars. 1. Jack the car up (we used a trolley jack to make this simpler; you can do it with a normal jack on each side though). 2. Place jack stands under solid supports for the car, lower the jack and make sure the car sits solidly on the stands. 3. Remove the radiator cap. 4. Place the oil pan under the radiator drain plug (this is located on the passenger side, on the bottom of the radiator). 5. Remove the drain plug, and catch the coolant in the oil pan. 6. Empty the coolant from the radiator bottle. You can either remove the bottle and empty it, or take the hose off the top of the radiator and feed it out under the car (gravity will then drain the water from the bottle). Once drained, replace. 7. Turn the car to “On” and set the air con to hot (maximum) and the fan speed to maximum as well. 8. Loosen the hose clamp from the heater hose, and remove the hose. Be careful when removing this hose, as the pipe that it connects to, is usually plastic and can be easily broken. 9. Place your hose, into the heater hose. 10. Turn on the hose with gradual pressure, so that water starts flowing from the drain plug but does not spurt out from the top of the radiator. Wait for clear water to flow out from the drain plug. 11. Put the hose into the other side of the heater hose and again wait for clear water to flow out from the drain plug. 12. Replace the heater hose. 13. Replace the drain plug. 14. Fill the coolant overflow bottle, with the new coolant. (We used a Coke bottle with the bottom cut off as a funnel). 15. Slowly fill the radiator with the new coolant, until it reaches the top. 16. Start the car, with the heater still on. 17. The coolant will start to bubble as the air in the system escapes. Keep filling the coolant back up when it gets low. 18. Once the system stops bubbling, rev the car, and maintain a constant rpm (2,000) for a while. This will open the thermostat (when the car reaches temperature) and will also pump the coolant through the system, pushing the air out through the radiator. Make sure you keep topping it up as required. 19. Once the system has stopped bubbling, replace the radiator cap. 20. Jack the car up. 21. Remove the jack stands. 22. Lower the car back onto the ground gently. 23. Take the car for a drive, and keep an eye on the temperature. 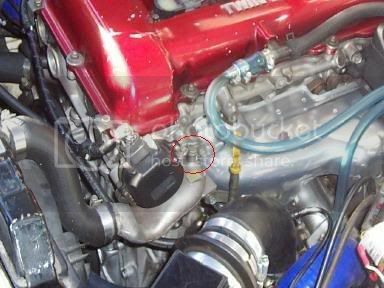 The SR20 also has a bleed valve, pretty handy little spot near the top left of the manifold. Undo the nut, to the radiator up, when that starts to flow, start the car and keep topping up till you have a non-bubbly fountain. Thread approved for Tech Articles by mayhem.